I always love the last two weeks of the year, partly because the December holiday I observe falls well before the one everyone else celebrates — so I get to relax while everyone else engages in perfectionist Christmas tree trimmings and card creations, messy baking bonanzas, stressful Santa sittings and last-minute shopping sprints. My family has quietly absorbed the meaning and traditions of a relatively minor holiday, Hanukkah, while everyone around us frantically prepares for a major event. But this year, for the first time in three decades, Christmas and Hanukkah overlap. We will all be in this frenzy together! As in years past, however, I remain determined to stay clear of most of this frenzy and dedicate this time for our family as one of giving, not receiving. In philanthropy, we focus on helping others all year long. But if there's ever a time to bring a little extra kindness and cheer to those around us, it's this time of year. Giving to Others: Last year, my son brought a large bundle of his stuffies and toys to Treehouse, a local nonprofit serving foster families. This year, he has picked Ronald McDonald House, a place we drive by often and he had volunteered with before), to receive a bag of new toys for children with highly compromised immune systems and for their siblings staying at the temporary residences. As he gets older, I hope he continues the selfless acts of generosity — giving away something that's important to you or that you may want for yourself, not just something you can spare. Freedom Celebration Night: We will invite friends over to make latkes and play dreidel (spinning top) games. Of course, we will have a dance party (with or without kids! ), as we have a good time celebrating our freedom. Book Night: This is an evening to celebrate the gift of reading. How fortunate we are to have access to education and so many books! I remind my son that he has more books in his room than some villages; we need to appreciate the doors this opens for us. This year, I plan to give him a special hardcover book about cultures around the world, inscribed with a loving message. Make Something Night: Last year, we cut out paper snowflakes to adorn our windows; this year, we added symbols of peace, reminding others of the peace we wish to see in the world outside. We also are writing out kindness messages on small strips of paper to anonymously share with others. 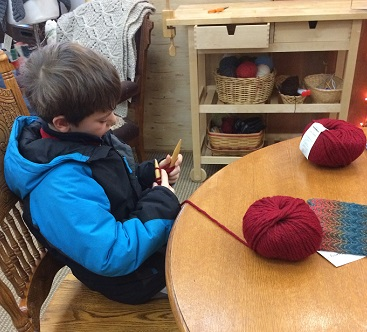 There's also the scarf my son has been knitting for his grandpa to show his love, one stitch at a time. Special Night: This is the gift of special time together. We choose a day or evening to do something out of the ordinary, like ice skating or seeing a show. There are many affordable or free performances taking place this time of year! Friends and Family Night: Another night to enjoy spending time with our friends, sharing in diverse perspectives and beliefs, and valuing the richness that we all bring to living each day in the best way we know how. New Friend Night: We invite someone new to our family, or someone who has never experienced the Hanukkah holiday before, to light the candles and share the evening with us. Celebrate All Religions: This is a new theme my son chose last year. I've been crowdsourcing for ideas, from making our own prayer flag and writing on each triangle many of the religions (including no religion) that exist in the world. At 8 years old, my son is still learning that there are many ways people around the world look to something larger than themselves to feel grounded and to give them hope. For many, 2016 has been a challenging year — and the holiday season can be tough, too. As we observe our traditions and consider our New Year's resolutions for 2017, let's remember: Whether or not we are in a position to make philanthropic gifts with our wallets, we can all give big with our hearts. Leslie Silverman is a partner with The Giving Practice, Philanthropy Northwest's consulting team. She can be reached at lsilverman@philanthropynw.org.